Professors Richard Ng, Paul Bruillard (Senior Machine Learning Researcher, Expedia Group), Zhenghan Wang (Microsoft Station Q, UC Santa Barbara) and Eric Rowell (Texas A&M) were awarded the 2019 Gerald L. Alexanderson Award of the American Institute of Mathematics. The Alexanderson Award is given annually by the American Institute of Mathematics (AIM) for an outstanding paper published in the previous three years that arose from an AIM workshop or SQuaRE. 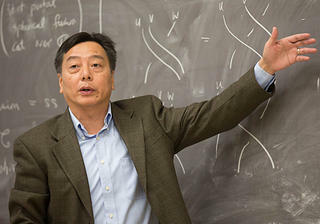 Richard Ng and his collaborators received the award for their paper Rank-finiteness for modular categories that appeared in the Journal of the American Mathematics Society (29), 2016, 857-881.